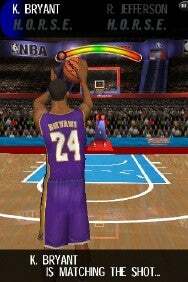 Kobe Bryant is one of many NBA players you can play as in Flick NBA Basketball. NBA fans will appreciate being able to play as the star player that represents each team. Some are obvious choices: Kobe Bryant represents the LA Lakers, Lebron James is the representative of the Cleveland Cavaliers, and Brandon Roy is the available player for the Portland Trail Blazers. Other available player choices are a bit suspect. Shaquille O’Neil is the only selectable player from the Suns, and any Suns will tell you that Amar’e Stoudemire or Steve Nash are the real stars of that team. Don’t get me started on Freeverse’s selection of Caron Butler over Gilbert “Agent Zero” Arenas for the Wizards. Not that you’ll have much use for the players’ likenesses. Flick Basketball is actually not one but five mini-games in one title, and only three of these use the players and even then they all play the same. Shaquille O’Neil has the same 3-Point shooting skills as Chris Paul, so the players really act as aesthetic skins rather than active determinates of your strategy. Multiplayer is available for the 3-Point shooting competition and HORSE by way of clicking “versus” and trading off turns using the same iPhone. So far, Wi-Fi multiplayer isn’t available. The soundtrack is pretty catchy, and the commentators veer from overly laudatory goofball comments (“Boo-yah!” et al) to overly dismissive clichés (“I’m sure glad his mother wasn’t around to see this!”). In this respect, yes, the game is a realistic recreation of the insufferable NBA commentators I usually hear on TNT. While the graphics are impressive and the players’ appearances are fairly accurate, you’ll be limited to using them in a 3-point shooting contest, playing HORSE, or engaging in a “Long Shot” race against time that you might recognize from various college basketball halftime competitions (you need to sink a layup, a free throw, a 3-pointer, and so on before time runs out). The “flick” motion with the iPhone’s touchscreen is a nice adaptation of the iPhone’s controls, and it’s pretty easy to just pick up and shoot. Frustratingly, this direct and simple control scheme is limited to the 3-Point shooting competition and “Hot Shot” arcade game. The HORSE and Long Shot mini-games require you to time your flicks to when the constantly moving reticule is centered. This is easier said than done, as the reticule moves faster and faster the further you get from the basket. Combining the flick motion with the timing aspect makes the game insanely difficult at points. I feel like I’d have a better shot at beating Dwayne Wade in HORSE in real life than in beating his digital form in Flick NBA Basketball. The last mini game, entitled “Spin Ball,” utilizes the flick controls of the previously discussed games and combines this with the motion controls of the iPhone. The ball-spinning mini-game is essentially just a test to see how long you can keep the ball on your digital finger before it falls off. It’s fun for about three minutes and then you’ll likely forget about it— much like the rest of this app. What’s most frustrating about the Flick NBA Basketball application is that it feels like Freeverse is selling you the leftovers of an actual basketball game. It appears to be that the developers spent all the money they could have spent on developing an actual basketball game into securing the expensive licensing rights of the NBA players, teams, and logos represented. Instead of developing a small sports simulator, you have aspects of the game of basketball dressed up real pretty and passed off as the real thing.